By David Craig, Snouts in the Trough – “Currently Europe’s (excluding Turkey) 50 million Muslims only make up about 7% of the total population. However, as Muslim communities tend to be found in the main cities, here the percentage of the population that are Muslim is much higher than in the general population. A rough rule of thumb is that the Muslim population of major European and UK cities and towns is growing at around 3% a year due to immigration and higher birth rates. Meanwhile the indigenous population of many cities and towns is falling by about 1.5% a year due to lower birth rates and “while flight”. 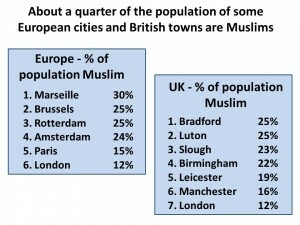 If these two trends continue, and there is no reason to suppose they won’t, then within 25 years Muslims will be in a majority in European cities like Marseille, Brussels, Amsterdam and Rotterdam and British cities and towns such as Birmingham, Luton, Slough, Bradford and Leicester. The implications of this change are quite profound. For example the politically -correct, immigration-loving Equality and Human Rights Commission estimates that half of Muslim men in Britain and three quarters of Muslim women don’t work. If this doesn’t change, then with ‘white flight’ leading to the departure of those who can afford to leave, major towns and cities could become massive slums where most people live off benefits. Moreover, when Muslims reach a majority, then we can expect the kinds of decisions taken by local mayors and councils will be very different from those taken today. We risk a future where cities and towns become increasingly Islamified, possibly causing social conflict between urban centres and the rest of the country. There are certainly interesting times ahead. 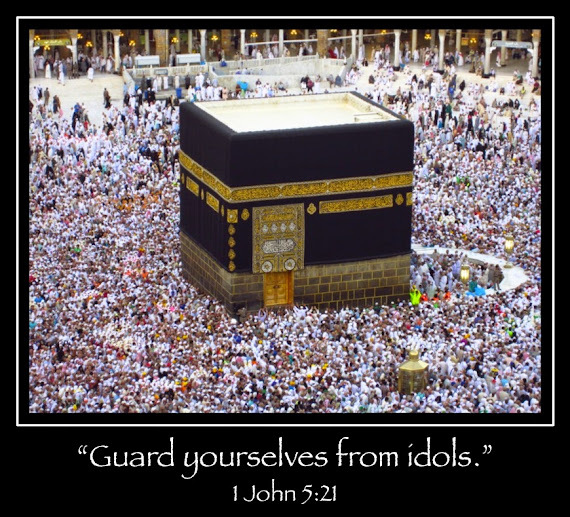 On the subject of the Islamification of Europe and Britain, my thanks to a reader who sent me this link http://www.youtube.com/watch?v=oTLeZWdr328 It’s a YouTube video made by someone called Pat Condell in which he recommends that the Islamophiliac Burka Broadcasting Corporation’s favourite moderate Muslim Anjem ‘Andy’ Choudary should be given a knighthood. It’s one of a series of videos by Condell where he comments, not always politely, on multiculturalism and religion, some of which have been removed by YouTube moderators. Many people will not agree with his views, but being an award-winning stand-up comedian, he’s quite an articulate and forthright speaker.” Source – Snout in the Trough.